Three new books in the IFLA Publications Series celebrate the broad spectrum of IFLA’s activities. 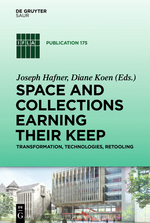 Space and Collections Earning Their Keep: Transformation, Technologies, Retooling, edited by Joseph Hafner and Diane Koen. Traditionally, libraries have served as storage spaces offering access to diverse physical collections. Today, following numerous social and technological changes, libraries are retooling their services, rethinking storage and reimagining their spaces. The transformation in information technology has had an enormous impact on users’ research behaviour, which in turn demands new discovery environments. A conference of the IFLA Library Buildings and Equipment and the Acquisition and Collection Development Sections spotlighted libraries from around the world who are providing quality, adaptable and innovative library spaces and services meeting the changing needs of their users, their collections, their staff and their communities. 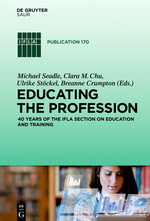 Educating the Profession: 40 years of the IFLA Section on Education and Training, edited by Michael Seadle, Clara Chu, Ulrike Stöckel and Breanne Crumpton. Education and training for the library profession have changed over the decades, and this publication looks both at the past and the future of these developments at schools of library and information science as well as the role of IFLA's Section on Education and Training. The chapters cover regional developments in Europe, Asia, Africa, Australia and the Americas; special topics, such as quality assurance and case studies; and future considerations in LIS education. 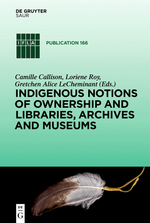 Indigenous Notions of Ownership and Libraries, Archives and Museums, edited by Camille Callison, Camille, Loriene Roy, Loriene and Gretchen Alice LeCheminant. Tangible and intangible forms of indigenous knowledges and cultural expressions are often found in libraries, archives or museums. Often the "legal" copyright is not held by the indigenous people’s group from which the knowledge or cultural expression originates. Indigenous peoples regard unauthorized use of their cultural expressions as theft and believe that the true expression of that knowledge can only be sustained, transformed, and remain dynamic in its proper cultural context. Readers will begin to understand how to respect and preserve these ways of knowing while appreciating the cultural memory institutions’ attempts to transfer the knowledges to the next generation. From buildings, to education, to indigenous knowledges and cultural expressions, these new IFLA Publications bring alive the vibrancy and breadth of IFLA’s interests.